Virtual Network Computing (VNC) allows you to share desktop environment on a local host with other remote users over network. To share desktop, a VNC server should be running on a local host, and remote users connect to the VNC server by using any VNC viewer client. In this tutorial, I will explain how to configure VNC server on Linux. In this set up, I will use vino, VNC server software for the GNOME desktop environment. After installation, you can start vino, and enable VNC server by entering vino-preferences command. 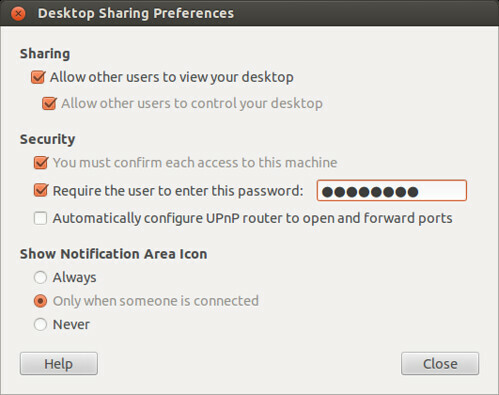 The above command will open up vino's desktop sharing preference window as shown below. On this window, click checkbox on "Sharing" to allow users to view and control your desktop. Optinally, set up VNC password. You can close the window after you are done with configuration. The vino-preferences utility is then supposed to start vino VNC server automatically. If VNC server is not launched for whatever reason, you can start VNC server manually as follows. On the latest Linux Mint Cinnamon desktop, vino-preferences is known to be missing. To enable and configure VNC server on Mint Cinnamon desktop, use dconf-editor instead, as described here. You can check if vino is running by typing the following command. As shown above, vino-server is running on TCP port number 5800 and 5900. You can use any VNC client software to connect to the VNC server. If VNC server is configured such that you must confirm each VNC access on your desktop, you will see the following pop up message every time a VNC connection request is received. Only when you allow VNC access, will VNC client be able to access your desktop. I has always confused myself watching the wide variety of VNC servers! Yeah tightvncserver is also a solid lightweight VNC server. It's just that vino comes with Ubuntu or Fedora by default, so you don't need to install any other software. What should I do in order to fix it and continue with the other stages? It no longer exists. Nothing you can do about it.